Pasta and her cute little Casio Mini Keyboard! Bringing Music to the little one’s life! Pasta and her Casio Mini Keyboard! Purchasing gifts for Pasta are easy but purchasing a special gift for her is something I cannot say easy! 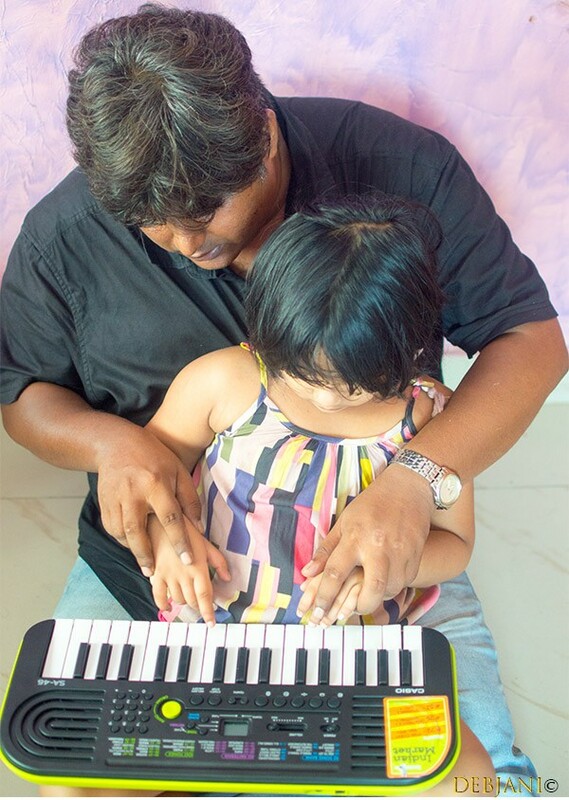 Almost a year back, we purchased a musical instrument for Pasta (read a Casio Mini Keyboard ) just out of the whims! Let me share what had happened before! “You daughter cannot speak properly. She is not as advanced as should be. Your daughter does not try to mix with the kids from her age yet your child is super-intelligent; she can identify geometric shapes and she can sing!” It was the 2nd parent-teacher meeting at my daughter’s school and I didn’t know whether I should be happy or not! Whether I should be bothered or not! What I understand she wants us to support her. We returned home and watched her. For the first time, not as the parents, but as unknown human creatures. At that night we started thinking about what she likes more and it probably was nature that helped us. Pasta alike every night asked me to play her favorite song! That was my answer to the confusing question. The next day I did a bit research on early childhood and found below mentioned really interesting. Somehow I believed will be interesting for Pasta as well knowing her preference for listening to music. They say Music helps the brain development of a child. They say music helps a child to face the society. They say Music can help in building the vocabulary. Music helps a lot in building the coordination skills. They say Music can work as a mood lifter. They say Music can help in the sensory development. 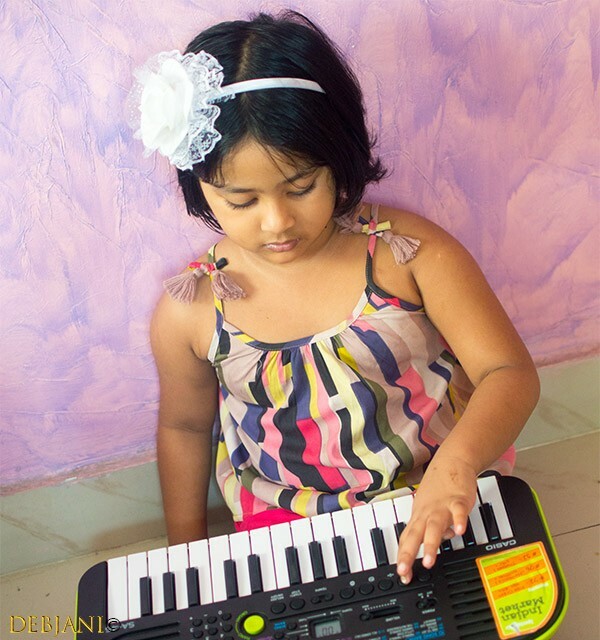 We get her admitted to a nearby dance class and purchased a Casio Mini Keyboard for her. Initially, Pasta neither was happy with the class nor was interested in her Mini Keyboard! We started sending her to the class and upon returning home I started playing the keyboard. Initially, it used to tune she was familiar with such as Twinkle Twinkle Little Star or Jungle bell! It took me more than a week to make her interested in the keyboard. I still remember a maximum of 5 minutes was her seating time initially! It took time at both the end and from there to today; when I see her seating and playing with her Casio Mini keyboard at a stretch of 15 minutes is kind of satisfying. She often asks me to play for her. Last week we have received her final report card. I cannot say she has topped the class but she has improved her inter-personal skills! She started talking at school. She started reciprocating too! For me, the situation is actually win-win! There is one more thing I must admit. She didn’t go through the dance class. She was not happy with the treatment of the teacher and we stopped the classes. 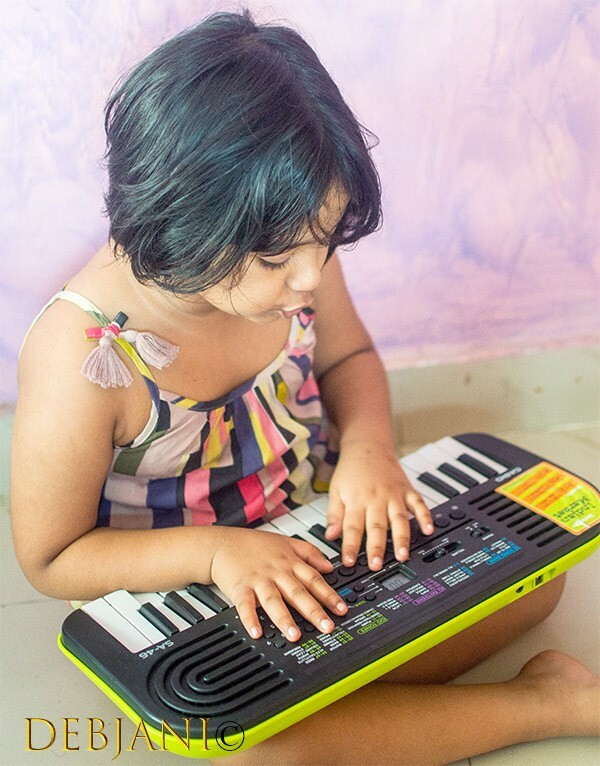 Instead, she started playing the Keyboard at home at her east. She started dancing to the tunes at her own. We had no expectation from her but it helped! Coming back to the Casio Mini Keyboard I purchased for her; it was pocket-savvy and most importantly user-friendly. It works both with electricity as well as using the Cells. This particular feature is really helpful. 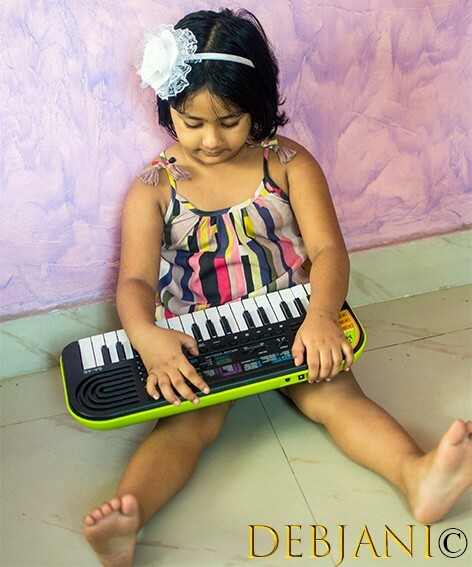 These days we carry her keyboard on the go and enjoy the way she plays it and also the way she sang. she may not be perfect but she is good enough for herself and her parents. She is happy and that is what matters at the end of the day. A worthy purchase I must say for the kids. It is wise to think beyond the expectations and just to work on the requirements without pressurizing the kids. It worked for me; not 100% but obviously to some point where I can see my child improving day by day. Pasta’s is a Casio SA 46V Model which is at present available for around INR 1895. This is not a very high-end model but perfect for 4.5 years old like ours. The Keyboard is handy and light-weight. Pasta can easily carry it. It can be used both ways; either using the electricity or battery. We do often carry the keyboard with us while going out! Last but not the least the lime green color is really soothing. Also, there is a headphone jack there but Pasta does not use it. Do check my Insta handle (@foodofdebjani) for the Video where Pasta is playing the Casio Mini Keyboard. Disclaimer: This post on our experience with Casio Mini Keyboard is written in collaboration with Casio. « Deli Pastry Shop – The Gateway Hotel Kolkata & my picks!